Cool iron and weathered wood create an industrial workspace. Product Description Salvaged Charm. 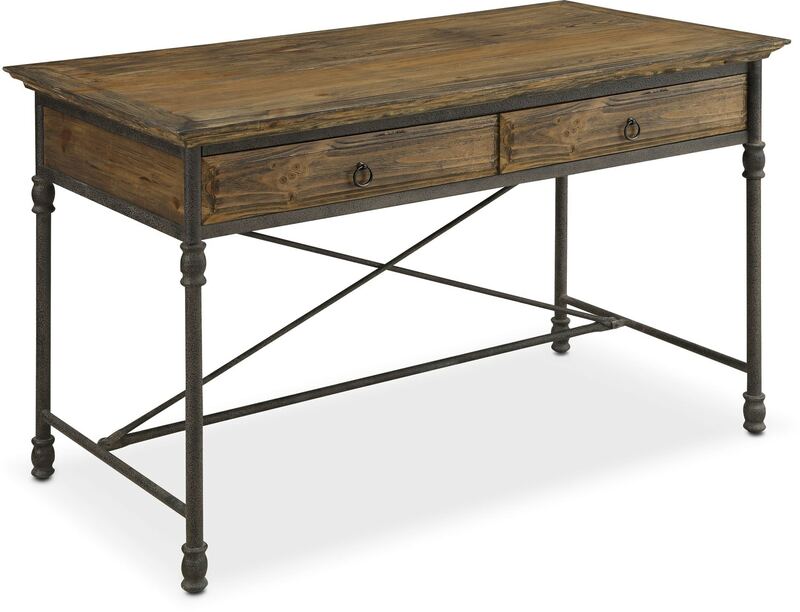 Rustic and bold, the Bedford desk features the natural charm of reclaimed wood. Finished in dark natural pine, this piece has stylish iron legs and classic beveled edges. Two wide drawers provide ample space for storing office necessities, books and collectibles, while a unique X-frame on the back of this desk adds visual interest. Customer assembly required. Unique Features: Rustic desk features natural charm of reclaimed wood. Includes slab top with beveled edges. Two wide drawers provide plenty of storage for office supplies. Antique brown metal bars and the X-brace on the back support the structure. Iron legs and accents offer superior support and industrial appeal. Construction: Constructed of pine solids and veneers with metal joints and legs for the highest durability.